Gloucestershire libraries manages 31 council run libraries. Our 2012 Library Strategy set out our commitment to provide Access, Aspiration, and Opportunity. Since 2012, the national offers have evolved for libraries and we have positioned libraries in Gloucestershire as a vital ‘front door’ for council services and have focused on developing the skills of our staff. Economic prosperity and business stimulation is a core goal of Gloucestershire County Council and when the opportunity to bid to be part of the Growth Hub network in Gloucestershire came in 2016 we leapt at the chance. National Policy: What are Growth Hubs? There is a network of 38 Growth Hubs in England which are local public/private sector partnerships led by the Local Enterprise Partnerships (LEPs). The Growth Hubs join up national and local business support so it is easy for businesses to find the help they need. In Gloucestershire the Growth Hub has a strong digital presence and all local businesses can access online business support. This is complimented by a network of local venues. 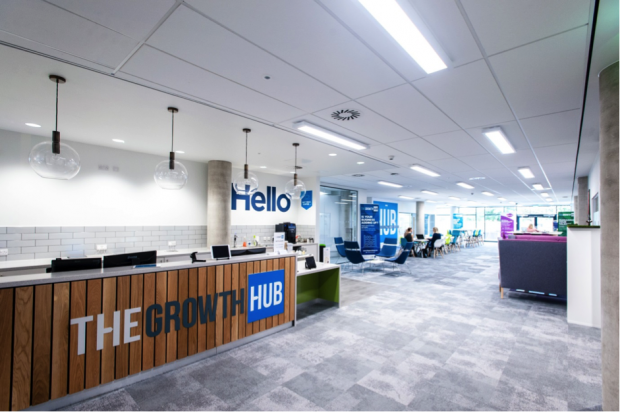 There are two Tier 1 Growth Hubs - one located at the University of Gloucestershire and the other at the Royal Agricultural University - that bring together a number of support services for businesses in ambitious and stimulating spaces. Smaller Tier 2 Growth Hubs are located in partner venues such as local council offices. Our 31 libraries are Tier 3 Growth Hubs offering sign posting, digital access and space for meetings. As you can see in the map below, our 31 Growth Hubs help provide excellent coverage across our rural and urban areas. Growth Hub funding sets eligibility criteria for the level of targeted support a business can receive. Dependent on whether moderate or high growth is predicted, a bespoke service from a growth specialist is offered. Insight, Highlight and Spotlight business growth events are offered to enhance marketing, sales, product development and management techniques. At a higher level, in-house Business Navigators and Business Guides are on-hand to offer bespoke support to businesses that show moderate growth and high growth respectively. Our library staff engage with local customers and provide access to information. We then direct them into the bespoke services offered by the Tier 2 and 1 Growth Hubs. We provide an accessible neutral environment to explore business ideas and access Growth Hub services. What added value can be offered by Growth Hubs? The Growth Hub in Gloucestershire is part of a range of services for local businesses, and benefits from strong links to both the Local Economic partnership, district councils, local business forums and both the University of Gloucestershire and Royal Agricultural University. GRIP is a university project part funded by the European Regional Development Fund Programme (ERDF) and offers businesses access to rapid prototyping using 3D print. Combining this access with the advice of a Business Navigator or Guide can help to rapidly develop a business from idea to launch. The Partnership with the Royal Agricultural University, Cirencester enables local businesses to benefit from expertise in agritech, an important area of growth in our county. How did libraries become part of the Growth Hub networks and why is it such a great partnership? In 2016 Gloucestershire LEP advertised the opportunity to develop Tier 2 and 3 Growth Hubs with expertise and capital funding. This felt like an opportunity we could not miss so we entered into 2 rounds of selection that then culminated in a dragon’s den session! Ultimately we were successful, attracting £224,000 capital funding. What the Growth Hub in Gloucestershire needed was venues that offered access, willing and skilled staff and an organisation with information skills, digital know how and intent. This is exactly what libraries could offer. Our bid was boosted by our intent to use the capital funds to enhance digital access with tablets, touch screen digital screens and digital marketing in libraries. We also committed to develop dedicated business space in our larger libraries offering semi-confidential meeting areas. The added benefit for the Growth Hub team was that this was all achievable working with one single partner experienced working with external funders, and with understanding of the monitoring and timelines that had to be met. The funding has enabled us to create a space for business users in every council run library in the county. These range in scale and service but all are underpinned by the main tenets of our offer to the Growth Hub network. We have a touch screen for customers and staff to access the Growth Hub portal. In addition, each library has a staff tablet to enable staff to engage with customers and answer business related enquiries. Every library has new business related collections offering inspiration and confidence as well as the standard “how to” guides. The choice of stock was prompted by our experience of working not only with business partners, but also with major creative contacts working in Gloucestershire. This meant we could bring a wide perspective to inform the range of business titles on offer, which would stimulate ideas and ultimately growth. Our stock offer (both physical and e-stock) also encompasses Cobra, now available via the Growth Portal to all registered businesses, and Mint which is accessible via our Ask Us service for the public, or via staff in any Gloucestershire library. Alongside the 31 venues in the heart of local communities, the other huge selling point for our bid was our staff. We offered a ready made team of staff who are expert in answering information requests and signposting and had been trained via the Digital Information Skills e-learning programme. Our staff are adept at promoting services so a person might walk off the street but soon be engaged in a conversation about the business service! The training prior to launching as Tier 3 Growth Hubs was delivered by the Growth Hub team, and focused on the ethos of the Growth Hub and the data that was required from staff. Our staff are responsible for capturing interactions with prospective Growth Hub service users and inputting data into the CRM system established by the Growth Hub. This data is important as it feeds into system monitoring the success of the funding and impact of the whole Growth Hub project. The Growth Hub in the county is establishing its profile – for instance they ran the Mannequin promotion to celebrate the opening of Gloucestershire Growth Hub’s new Gloucester base. However the fit between libraries and business information signposting has proved to be natural for us and our customers are benefitting. We had always felt that our USP was to reach members of the local community who might not have known about Growth Hub resources or who didn’t even realise they a business idea so we could point them in the right direction. We were only expecting light touch interactions but it turns out that we have also reached people who have gone on to access more in depth consultations which shows we are really contributing to growing the local economy. An important issue is that we don’t define who our customers are. Any of our library users could have a business idea or need. Instead we expose them to the services offered by the Growth Hub and encourage take up of the services and resources on offer. A library customer visited a small town library and as part of our sign posting the staff member mentioned the new Growth Hub service. The customer, who had visited for leisure, indicated this was of interest and as a result has now benefited from several business courses, and an initial business consultation with hopes that this will lead to establishment as a small business. A local business approached the library as a consultation venue for a local expansion of their operations. We agreed and during our conversations we also promoted the Growth Hub services and they have since also accessed advice and support. As part of our bid we included a proposal to fund makerspaces within our libraries. Our confidence in the idea paid off and we were given £34,000 capital to invest in equipment. We have since launched our first Innovation Lab at Coleford in the Forest of Dean, and we are now active in the economic partnership activities for that area alongside the district council and local businesses. The Innovation Lab brings together Virtual Reality, 3D print and design, robotics and a wide range of micro computing and coding opportunities and it’s exciting to see how this service will evolve. Our commitment to focus on two main areas was integral to our bid for this maker element: engagement for businesses and community engagement, particularly with young people. The Growth Hub team have been supportive of this vision, recognising the value achieved from working with young people to stimulate future skills, digital confidence and economic prosperity. We want to work with young people giving them the opportunity to explore the equipment and ideas and experiment - hence our tag line “Think it. Design it. Make it”. The funding we achieved was capital only and we had to be realistic from the start on how we would manage the revenue impact of this project. We have not increased our staff team but alongside the adoption of the Growth Hub role, we have continued to create capacity by streamlining how we deliver other elements of our service. We've had to develop new skills as the service has evolved, and to identify where we are lacking. We have encouraged staff to learn and play with the equipment generating a real enthusiasm for trying something new and extending the use of the equipment beyond the Innovation Lab in Coleford. We have also recently recruited an Innovation Lab Manager to further develop the concept and secure the future of this exciting service. By winning this funding we have successfully positioned our service more prominently within the rest of the county council. Our success and ambition has been viewed positively at all levels of the council and has enabled us to be involved in projects we might previously have been omitted from. We value being able to draw on expertise from the Growth Hub team. This is a team with a huge range of expertise in marketing, digital and business development and it has been a positive experience working with them. We’ve gained access to new networks and business groups. By joining the Growth Hub network we now have access to a wide range of new business, digital and creative contacts and this is enhancing our own skills and development. We have learnt that we should have greater confidence in what our library service can offer. We are a fantastic partner for others and we must remember this! The Gloucestershire Growth Hub Network has benefitted by being able to provide 31 professional venues across the county with one partner in an efficient way and this has been valuable for them and very positive for us. To find out more about the library growth hub network, bookmark our web pages. If you have any questions about the project, please contact me: katie.a.smith@gloucestershire.gov.uk. And to keep up to date with all activity in Gloucestershire libraries follow us on twitter or on facebook.